The pitted texture of the abdomen intrigues me. Is it a potter wasp? 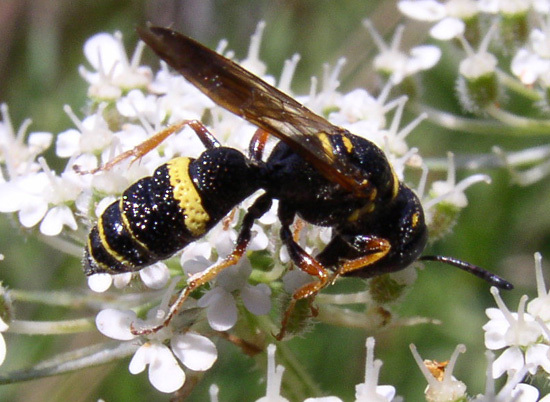 The flatly crossed wings, rather than folded at rest, help to tell apart such black and yellow Sphecids from true wasps. As the abdominal markings are clearly visible, an ID to the species level should be possible. Maine has a relatively reduced fauna compared to the southern states. Right family and subfamily, but this is a species of Philanthus, the "bee wolves." Not certain of the species.